Leonard L. Dennis, son of Duane and Anna Dennis, was born in Riverdale, Nebraska on September 30, 1920. Dennis played Ban Johnson League baseball for the Fairbury and Beatrice teams in Nebraska. The Ban Johnson League started in Kansas City, Missouri in 1927 and was sponsored by American League president Ban Johnson. Created as a recreation for teenagers, it later allowed men of up to 21 to play. By 1936 it had grown to 50 teams with two leagues in Missouri, four in Kansas, four in Oklahoma and two more in Texas. Players signed contracts, managers received pay and clubs charged admission to the games. Dennis joined the Marine Corps in 1941 and was assigned to the elite Marine Raiders. Organized in January 1942 and disbanded just two years later, the Raider battalions were developed as a Marine Corps special mission force, based on the success of the British commandos. Lightly armed and intensely trained, the Raiders had a three-fold mission: spearhead larger amphibious landings on beaches thought to be inaccessible, conduct raids requiring surprise and high speed, and operate as guerrilla units for lengthy periods behind enemy lines. On November 1, 1943, Corporal Dennis was with the 2nd Marine Raider Regiment during their assault on Bougainville, the largest of the Solomon Islands. This was the final combat action of the Raiders before their dissolution. 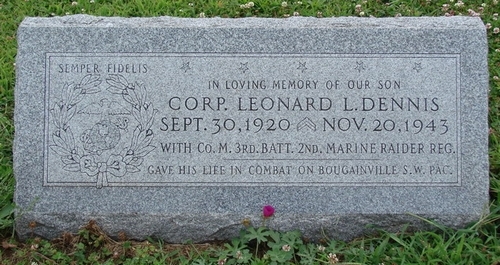 Leonard Dennis was killed in action at Bougainville on November 20, 1943. He is buried at Riverdale Cemetery in Riverdale, Nebraska.